It is not uncommon to encounter a repair for your roof before the life of the installation is up. There are many causes for premature wear and tear on your roof. Here in Calgary, we face a multitude of weather such as heavy winds, torrential downpours and massive dumps of snow in the winter. Given the unpredictable nature of the weather in Calgary, it is easy to see that a roof repair can be more likely then not. That is why here at H&J Roofing and Exteriors we recommend all our clients have their roof inspected every couple of years. 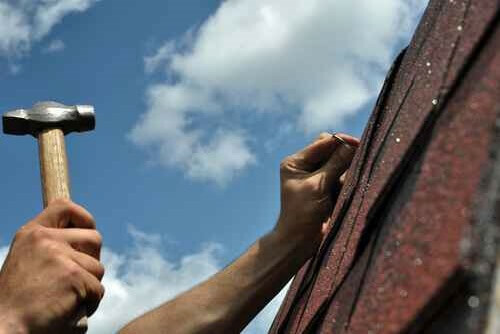 Let us take a look at the four most common roof repairs. During strong windstorms in Calgary, we can see wind speeds over 100 kilometres an hour, with gusts up to 150 kilometres an hour. 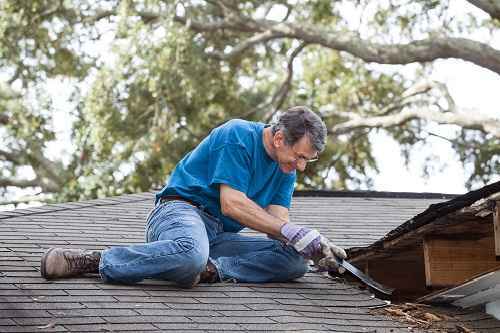 This dominant force can work its way underneath your roofs shingle with enough stress to cause the nails to pull through the shingle. This leaves a vulnerable opening in your roof for other elements to work there way in. A preventative measure to avoid this type of repair would be to opt for an upgraded shingle when getting your roof replaced, which has a nail strip. This nail strip prevents the nails from pull through during high winds. With Calgary located in southern Alberta, it is subject to hail storms every year. In this region, hail can reach the size of golf balls, which can have devastating effects on both your homes roof and siding. Here at H&J Roofing and Exteriors, we work directly with your insurance company to streamline the process of your insurance claim. Whether the claim is for a repair or full replacement, we walk our clients through every step of the way. If hail is a problem in your area and you are tired of paying high deductibles an upgraded impact resistant shingle might be your best bet. Although the initial cost is more for an impact resistant shingle you may save more money in two ways. You may avoid the cost of a repair associated with hail damage. Your insurance company will lower your deductible for a claim. How do ice dams occur? When the snow on top our roofs starts to melt it travels down the slope of the roof until it eventually reaches the eavestrough. But sometimes the temperature changes before the snow has time to vanish entirely and it refreezes. Once this process takes place a couple of times, it creates a block of ice at the edge of the roof. This block of ice prevents the water from flowing in the eavestrough causing it to travel back up the roof and underneath the tabs of the shingle. This is how ice damming causes leaks. To prevent leakage from ice damming here at H&J Roofing and Exteriors we recommend applying an underlayment beneath your roofs shingles call ice and water. This underlayment adheres fully to the wood decking below and stops any water that works its way under the shingle from penetrating the decking and into the home. We’re happy to help. Give us a call at (587) 433-9746 or leave us a message so we can discuss your roofing problems.